Pretty fully renovated double fisherman house in a quiet area close to the center and the beach. Thanks to its double exposure and its renovation, it will fit with your criteria. On the street side, a terrace with flowers and a jacuzzi. On the canal side, a wide terrace with a superb view on the canal. 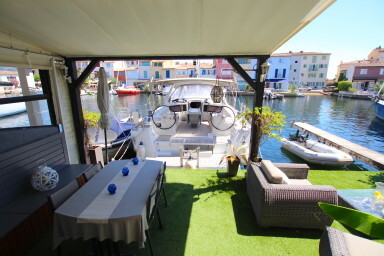 This terrace leads to two 14m x 4,20m moorings, perfect for a boat and a dinghy or a jet-ski. Inside, on the ground floor: a living-room, a dining-room with an open-plan kitchen, a laundry and guest toilets. On the 1st floor, 4 bedrooms and 2 shower-rooms. On the top floor, a large master-bedroom, a study, a bedroom, a shower-room and a large bathroom. On the canal side there is a balcony with sea view all along the house. An exceptional house that will charm you!